Robert Caplin takes up the challenges of video and creates a music video of his kid sister with a Canon 5D Mark II. So, I decided to shoot a video. I've held out for the past four years because I really felt telling the news, as a video journalist, just wasn't for me. That was until I found myself with my newest camera upgrade, the Canon 5D Mark II, a still-camera that takes surprisingly high-quality video. I'm sure you've heard of it. I've always enjoyed playing around with camcorder-style video cameras, though I never had the fortitude to deal with all the headache of post-processing (photo editing is difficult enough), hence my aversion to pursuing the video route in the first place. It wasn't until this camera upgrade that I was given the opportunity to take such high-quality video using my existing lenses. After playing with the video function on a few assignments I found the 5DII incredibly simple to use when taking video footage, though with a few feature limitations that I otherwise depend upon while shooting stills. When my 15-year-old sister Etana called to ask if she could come to the city for a visit, the idea of shooting a music video came to mind. 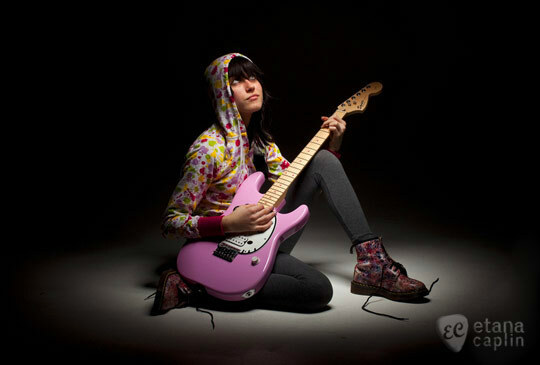 She's a really talented singer/songwriter, especially for her age. It seemed like a prime opportunity to jump right into the video end of the pool. Initially I thought of it as a way to bond with her, but after shooting the first scene and looking back at the footage I quickly realized how cool of a video it could be if we all put in the effort. Etana immediately went directly to a recording studio and recorded a vocal and acoustic track completed to act as the foundation for the video. Not possessing anywhere near the logistical support needed for a real video, we put the Mp3 on my iPhone and played it back over the speaker in all the different locations as she sang the song for the camera. The only gear used was a Gitzo Tripod, the 5DMII, and an assortment of very fast prime lenses, as well as a light reflector to bounce the light in one scene. No artificial light was used in the making of the video. We began filming in my living room, with the idea to open and close the video with Etana answering and ending a phone call. I found that setting up the scenes were a bit more difficult when using a tripod because of the lack of mobility to slightly alter the perspective. This also has a lot to do with the type of head I used, as I didn't have a video swivel, rather only a ball head that locks into place. A proper video head is definitely now on my wish -list. While in the backyard, I set up another shot of her sitting at the snow-covered table and found getting a proper exposure to be difficult because of the bright snow, a definite limitation of the 5DMII. I was able to use the +/- compensation to over-expose the scene to accommodate for the lack of manual controls, but found it difficult to maintain proper exposure control when the light changed dynamically. We then decided to take the shoot on-location to Central Park along the famous Poet's Walk, a place Etana has a fondness for (she performed on a park bench for tips when she visited last June). It was a far cry from the warmth of the summer; it was a blustery 15-degree, snowy day. Already freezing, I set the camera up on the tripod, framed the scene, pushed play and we took one take from each camera angle. It was then I realized the logistics that need to go into planning a production. Granted, I was shooting guerilla-style without permits, but it would have really helped to have a trailer or tent to warm up in. I felt badly for Etana when she had to take off her winter coat for the scenes. After taking about 10 minutes of footage, we had to leave because she was beginning to suffer from the cold. Access to Times Square was difficult due to the main areas in the center still blocked off from the New Years Eve festivities the night before. We were fortunate to find a spot untouched by tourists. There we were able to pull off one take of the song before the blustery cold again overtook Etana. Sound was another issue I need to think about when planning my next shoot. The noise in Times Square made the iPhone speaker useless, so we were forced to have her hold the phone to her ear as if she was taking a phone call. Proper wiring with a headset or use of a louder speaker will be necessary when I shoot my next music video. After we finished shooting all the scenes, Laia spliced and cut a very rough version of the video. The quality that came out of the original iMovie 'take' really surprised us, but we did find the program to be very limiting. It's similar to the difference between iPhoto and Photoshop (or Aperture). So we upgraded to Final Cut Pro. It was time get a little feedback from trusted friends and the feedback I received was very helpful. It was suggested I pick up the pace of the cuts and not linger too long on each scene. I was told I needed more footage in which the camera was off the tripod and in motion. It was critiqued that the video lacked a narrative and those recommendations were 100% right. At that point I decided it would be worthwhile to fly back home to Ohio and get more footage to tell the story - and without the tripod this time. Along with booking in two days of portrait sessions, I went to the local mall with Etana and several of her friends (including her boyfriend who played a primary role), and followed them around as if they were stars in a reality show. I wanted to show her relationships and how they related to the song she was singing. I think after re-cutting the video, the extra footage really helped break up the repetitiveness of the original cuts. Also, I think it helped show another side of Etana. The last thing we did while in Ohio was hit the recording studio and add musical accompaniment to help fill out the song. On top of her voice and guitar track, a bass guitar, drums, tambourine, and shakers were added. I really feel the addition to the audio provided a radical and welcome addition to the presentation. We were all very excited to see what was created. It was just when I thought I was finished that I visited a filmmaker friend's studio and was introduced to the world of video color correction and fancy filters. At first I didn't think I needed any, but when he applied them to a few scenes, it really made a difference to the feel of the video as a whole. The 5DMII tends to saturate the scenes a bit too much. What I thought would be a fun-filled few days experimenting with my new camera to pull together a rough music video starring my kid-sister, quickly turned into a month-long production. I know the video has its flaws, all of which were lessons learned during my first-ever attempt, but I'm really excited to now share it with you all. This little brother-sister bonding project truly opened my eyes to the potential of a new visual passion of mine. I think it's a good time to embrace the exciting technological advancements. It took me until now to jump on the bandwagon… and I don't plan to jump off anytime soon!